Introduced in TYCO's 1978 catalog, the Silver Streak (No.7322) set included a chrome plated Alco Century 430 wearing a Santa Fe-like red warbonnet scheme and a Union Pacific herald on its nose. TYCO used the UP herald that included "Railroad" beneath the "Union Pacific" name, which was dropped by the road in the early 1970s. Typical of TYCO's Alco 430 models, the Silver Streak carries the roadnumber 4301. The Silver Streak Alco 430 originally had a chrome roofline, which is traded for a red roof on later production run examples. TYCO generally made alterations in sets that ran across a number of years. For example, TYCO's Chattanooga set goes through numerous changes during its run in the line. The Silver Streak is different in that the set's contents remain static for the period it is included in the TYCO line. 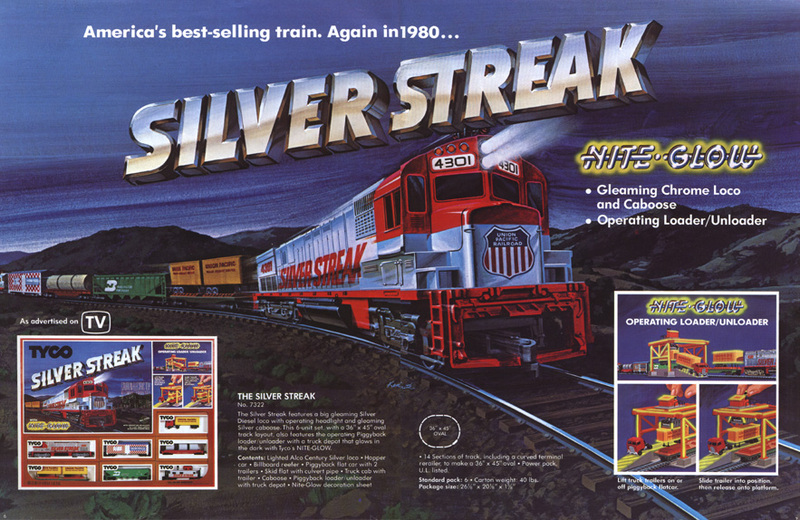 The Silver Streak train set also retains the same stock number, 7322, for its entire run. The set included TYCO's Piggyback Loader/Unloader (No.903) with Union Pacific piggyback trailers on a green ATSF 50' Flat Car. Other rolling stock in the set included a green 50' Burlington Northern Plug Door Box Car; red 40' Great Northern Skid Flat with 3 Culvert Pipe Sections; a 40' Ralston Purina Reefer; and a Streamline Cupola Silver Streak Caboose. The set also featured a set of Nite-Glow glow in the dark stickers and a cardstock Truck Depot. TYCO included a third UP piggyback with a red Truck Cab that was packaged in its own brown box in the set. 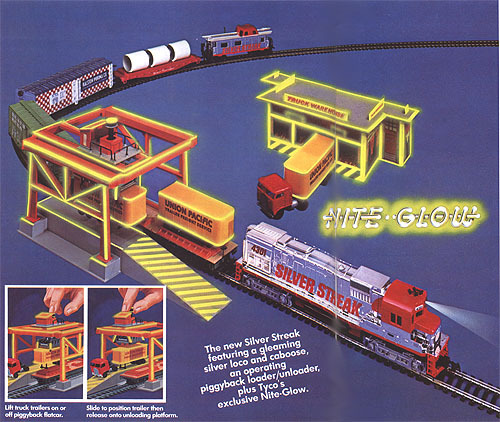 The Truck Depot was unique to this set and is not known to have been offered as a separate TYCO item. The track plan was a 35" x 45" oval of track and a power pack was also included.